In his early career, Quincy painted soothing landscapes of pastoral subject matter. After his time in the Army, he turned to subject matter of bloody Indian wars and men killing animals. 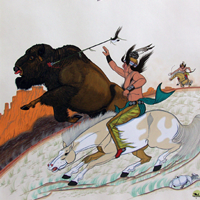 He established a studio in Santa Fe and shared it with now famous southwest artists such as Harrison Begay. Quincy was known for his energy filled action scenes of Plains Indians.